These Sign Mounts Will Draw Customers' Attention to Your Displays. 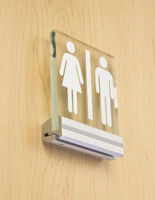 These Unique Signage Holders are the Perfect Way to Get Your Business Noticed. These Sign Mounts do not Require Holes to be Made in Your Displays. Adjustable clamp hold signage from 1/8" to 3/8" thick! Satin silver anodized finish coordinates with any environment! 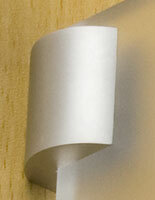 Includes hardware for quick & easy wall-mounting! 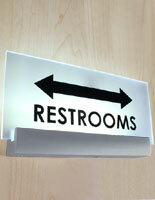 These sign mounts help to make attention grabbing displays for any environment. The clamp style wall hung displays several styles of materials, of which acrylic is one, and thickness is not a problem. These sign holders, sign mounts are 2" in length and will suspend small displays, but there are bigger holders for hold larger displays. These wall hung brackets are the ideal fixtures for plaques in any type of setting, for instance commercial spaces, office hallways and hospital corridors. The sign mounts are perfect for any business that employees a transient population of employees because the signage is very easy to remove or replace. 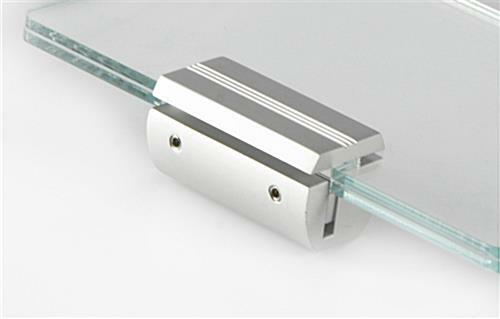 These sandwich standoffs are constructed of extruded aluminum that has a soft silver anodized finish, which will add a bit of class to any setting in which it is used and to any style of signage chosen. 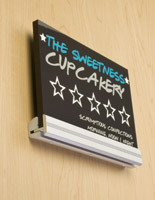 The sign mounts, called wall display systems, use a bracket-like design that has a "tab A" fitting into "slot B" profile. In order to affix your acrylic signage within the sandwich holders, the "female" section must first be fastened to a wall. Next, the sign mounts are able to fit together with your signage in between each part and will have a more permanent hold once the screws are tightened with the appropriate Allen wrench. These aluminum wall displays hold your plaque 9/16" off of the mounting surface, showcasing a three-dimensional look. 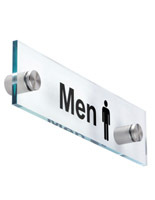 These sign mounts are an economical way to add a more stylish and modern look to your commercial or office space. 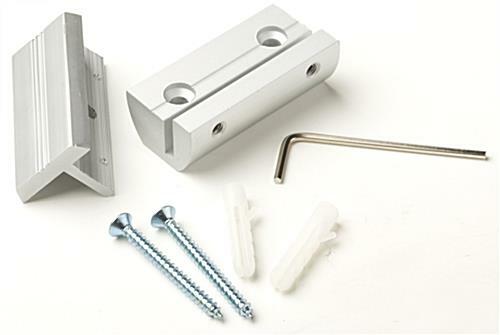 All of the hardware needed to affix this silver bracket to the wall in included with your purchase; we even provide the Allen wrench. 2.0" x 1.0" x 14.4"